Martin Crook has completed an epic power endurance traverse line at Tan y Grisiau. Pump Station Zebra 7A+/B is located 5 minutes further up the dam road past the Hippocampus block, but set back behind a stone wall, which is itself about 100m from the road. The traverse runs, from the obvious sitting start position, left-to-right across the zebra-striped striations on the steep wall. 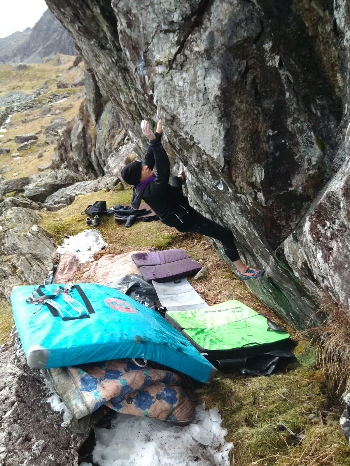 A range of pinches, crimps and slopers lead to the pressure drop crux move and a physical span to big boss at base of groove. The last half is a posing lap on slabby rock. An alternative low version of a similar standard comes nicely into the drop move. NB. It needs four dry days to come into condition as the groove at the end of the steep section seeps.